Well, for my first Christmas post, I wanted to focus on something that we started last year that helps us focus on the true meaning of the Christmas season. I cannot remember where I got the idea, but I loved it and knew I wanted to make it a priority for our family traditions. It's a countdown to Christmas with books. 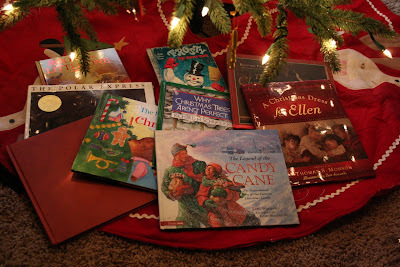 I love Christmas books and love reading them to my kids. I wrap 25 books and number them, and each night we unwrap a book and read itogether. Some are funny, some are silly, some are classics, and some just are so touching they make me cry every time. It doesn't matter if we get back home super late or how crazy the day has been, it's just a great way to quietly finish each of the nights before Christmas. Plus, what a great incentive for getting teeth brushed and jammies on quickly so we can unwrap a book! 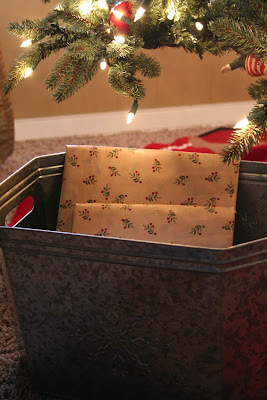 On Christmas Eve you can unwrap the scriptures to read the accounts of Christ's birth. What book should I buy this year? I love new recommendations~what are your favorites? I have lots of fun Christmas decor and projects this week~see you soon! We do this, sort of (we may not get to all 25 days, and I don't wrap them). I got the idea from a homeschooling board several years ago. We have several books, but I also get some from the library. One of ours is "Toot and Puddle; I'll be Home for Christmas" by Holly Hobbie. One of my favorites is "A Christmas Bell for Anya". It's a tear jerker that has a wonderful christmas message. I got this book for 99 cents at Desseret book online so keep an eye out for that if you don't already have this one. We decided to do this last year. I went to the thrift stores near me and found enough books to add to what we already had to get to 25. Nice books can get expensive, so that was our affordable solution. What a great tradition! I love this idea! I don't have any books we unwrap, but I have an advent book of stories we read each night. I love this idea better. I may have to start that next year! I love this idea too! A new tradition is born for our family. This is such a wonderful idea! I am with you, having a two year old does not help in keeping the books wrapped and under the tree, but I can improvise! That is a great tradition. I love the idea of wrapping them up and then unwrapping one each night in December. I also have a Chrismtas book collection. I think I might copy your idea. Thanks! I try to add a new Christmas book to our collection every year too. One year I did wrap them up too. You have a lot of great books- some that I really need to look into. Another favorite of mine that I bawl through is The Crippled Lamb. What a great idea! I'm going to have to do this! My favorite Christmas book is Auntie Claus by Elise Primavera. There is also a second book called Auntie Clause and the Key to Christmas. I have not heard of any of these, so I'll have to check them out~thanks for all of the suggestions! And Salsa Mama, getting books at thrift stores is a great way to go! I love this idea. I am so excited about all these traditions as our son gets older. What another great idea to add to the list! Have you seen the film of "The Christmas Miracle of Jonathan Toomey" with Tom Berenger? It's on Amazon. This is a great idea! Never thought of it. We love to read here. We always read a couple of books at bedtime, but this would be so exciting for the kids to be able to unwrap the books! Thanks for the idea! What a wonderful idea! My daughter loves for me to read to her at night so this would be a good tradition to start. We read our books every Christmas and LOVE them - we don't get them out until Dec. 1st. Some of our favorites are: Merry Christmas Strega Nona by Tomie dePaola, any version of the Nutcracker, any version of "The Night Before Christmas" and we have a lot of just silly ones. We love them all. I can't wait to see your projects. The Christmas Miracle of J. Toomey is one of my very favorite Christmas books, too. Your ideas of reading one special book each night is wonderful! my friend and i do this too! i'm still collecting books. i love going the day after Christmas to a bookstore and buying them for super-cheap. What a wonderful idea. I haven't heard of a few of these books. I will have to check them out. My all time favorite is the Polar Express. My suggestion is Miss Flora McFlimsey's Christmas Eve. It's about a doll who comes to life on Christmas by the author Marietta. Written long ago, it's a classic to add to your collection!